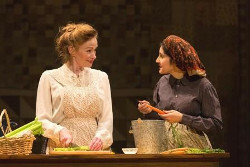 "The Immigrant" settles in George Street Playhouse"
L-R: Ima (Gretchen Hall) and Leah (Lauriel Friedman). Photo by T. Charles Erickson. George Street Playhouse,103 College Farm Road, New Brunswick NJ. Performances Wed. & Fri. at 8pm; Thurs. at 2; Sat. at 2 &8; Sun. at 2pm & 7pm. Ever wonder what happens to the inhabitants of Anatevka after they are driven from their village at the end of "Fiddler on the Roof?” We know that some of Tevye's family will be staying with Uncle Abram in America (he doesn't know it yet), but there must have been hundreds more than are represented in the "Fiddler"exit tableau. 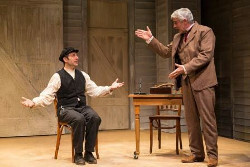 I might have encountered one of those refugees last week at George Street Playhouse in New Brunswick, New Jersey, in the person of Haskell Harelik, a twenty-something Russian Jew whose harrowing journey from Anatevka (why not?) to the U.S. is enacted in the opening minutes of "The Immigrant. "Mark Harelik's 1985 play is based on his actual grandfather's 1909 arrival and assimilation into the U.S., but the characters and subject matter transcend the specific. They are as relevant today as when the play is set. Having arrived through the port of Galveston, Haskell (Benjamin Pelteson), fatigued from wheeling his barrow of penny bananas, ends up in the front yard of Milton and Ima Perry (R. Ward Duffy and Gretchen Hall) in the rural community of Hamilton, Texas. (Between 1906 and '14, U.S. Immigration diverted some 10,000 Jewish immigrants westward to avoid their concentration in New York City. How did that work out?) After some language-barrier confusion, which Ima tries to overcome BY TALKING LOUD AND SLOW, the devout Christian woman convinces her banker husband to give Haskell a room for the night, which, after some awkwardness over his being Jewish, turns into six weeks. That ethnic awkwardness, even among the townsfolk, is minimized in favor of exploring the relationships and the Harelik family lineage. Specific as that seems, it represents the experience of countless numbers of escapees, particularly Jews, from the pogroms of Eastern Europe in the early 20th Century and from Western European oppression a generation later. The first act is a seamless progression of Haskell's assimilation and the growing bond of friendship between the unlikely couples after Haskell's young wife Leah (Lauriel Friedman) finally joins him. The process is not without some stumbling blocks, but the overall tone is welcoming. With Milton's financial backing, including to purchase a horse (Tevye would be pleased), Haskell's wheelbarrow morphs into a fruit stand and eventually a grocery store. The second act is crowded with Harelik-family details and some disconcerting melodrama. When Leah becomes pregnant, she turns to Ima for comfort and the two establish a warm mother-daughter relationship, which Hall and Friedman portray as if it were true. (Their naturalistic kitchen scene is a gem.) The young couple has two more sons (or three – I lost count) in rapid succession, the youngest of whom was the playwright's father. We zoom through their growing up, including one World War II enlistee. L-R: Haskell (Benjamin Pelteson) and Milton (R. Ward Duffy). Photo by T. Charles Erickson. There's some business about Milton not having been baptized, which of course presages his demise, and an allusion or two to Milton and Ima's son, who left home years before. In a climactic scene Milton and Ima are guests at Shabbat dinner for the first time (after 30 years of close friendship? Really?) At any rate, the dinner-rituals are explained to the guests – and through them to the audience. At that dinner, the two men argue over America's role in the coming war and its impact in Europe, with Haskell urging intervention in opposition to Milton's isolationism. After a personal insult (about the missing son), Milton storms out, effectively ending their friendship. Pelteson is excellent throughout. As Haskell initially grapples with the language, the actor mines the humor without poking fun at the character. Milton progresses from mere tolerance (of Haskell) to gruff affection, and finally to hostility. Duffy meets the challenge effectively, as does Ms. Friedman as Leah, at first shy and fearful and later secure as wife and mother (and the playwright's grandmother). Ima is the only role with substantial two-scenes with each of the others, and Ms. Hall is wonderful. Ima interacts differently with each character, but it all emanates from the one multi-faceted woman. Hall's Ima is a pre-modern feminist – if only the designation existed at that time in Hamilton, Texas. Under Jim Jack's smooth direction, the relationships grow and deepen over the years, with the cast aging believably, not overdone. Jason Simms' scenic design allows for multiple locations without clutter, and Asta Bennie Hostetter's costumes are ethnic- and period-authentic, the latter modeled to perfection by Ms. Hall. According to the playwright's bio, "The Immigrant"was the most widely produced play in the country in 1991. I saw it for the first time this month, and am glad that I did. You would be too.